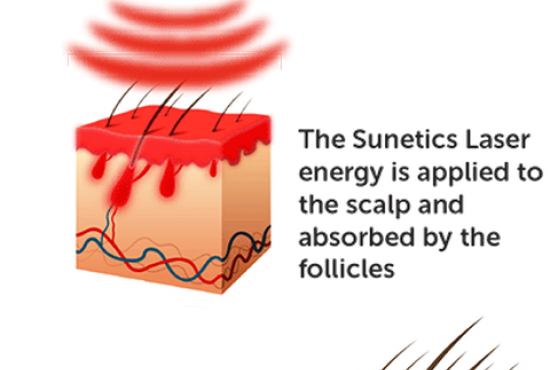 The Sunetics Laser uses Low-Level Laser Therapy (LLLT) to stimulate the hair follicles, healing them and helping them to regrow into thick, normal sized hairs. Our FDA Cleared technology offers No Pain, No Drugs, No Surgery, and No Side Effects. Hair grows in a continuous cycle. The hair growth cycle consists of four phases: Growth (Anagen), Transition (Catagen), Resting (Telogen), and Shedding (Exogen). The image shown illustrates each of these phases throughout the life of the hair. At any given time, 10-20% of your hair is in the Catagen or Telogen phase waiting to be shed and replaced by an active Anagen hair (similar to the way a baby tooth is pushed out by a permanent tooth), while up to 90% of your hair is growing. The Growth phase typically lasts 3-6 years in a healthy hair, but if the Growth phase is shortened, hair will enter the other phases to quickly and start to thin.